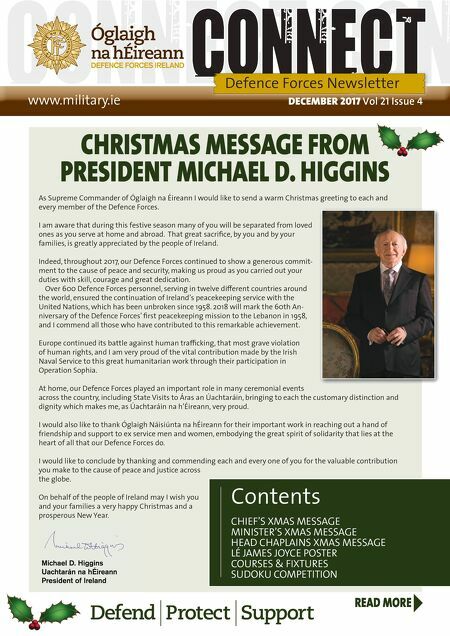 DECEMBER 2017 Vol 21 Issue 4 www.military.ie DECEMBER 2017 DECEMBER 2017 Vol Vol 21 21 Issue Issue 4 Defence Forces Newsletter READ MORE CHRISTMAS MESSAGE FROM PRESIDENT MICHAEL D. HIGGINS Contents CHIEF'S XMAS MESSAGE MINISTER'S XMAS MESSAGE HEAD CHAPLAINS XMAS MESSAGE LÉ JAMES JOYCE POSTER COURSES & FIXTURES SUDOKU COMPETITION As Supreme Commander of Óglaigh na Éireann I would like to send a warm Christmas greeting to each and every member of the Defence Forces. I am aware that during this festive season many of you will be separated from loved ones as you serve at home and abroad. That great sacrifi ce, by you and by your families, is greatly appreciated by the people of Ireland. Indeed, throughout 2017, our Defence Forces continued to show a generous commit- ment to the cause of peace and security, making us proud as you carried out your duties with skill, courage and great dedication. Over 600 Defence Forces personnel, serving in twelve diff erent countries around the world, ensured the continuation of Ireland's peacekeeping service with the United Nations, which has been unbroken since 1958. 2018 will mark the 60th An- niversary of the Defence Forces' fi rst peacekeeping mission to the Lebanon in 1958, and I commend all those who have contributed to this remarkable achievement. Europe continued its battle against human traffi cking, that most grave violation of human rights, and I am very proud of the vital contribution made by the Irish Naval Service to this great humanitarian work through their participation in Operation Sophia. At home, our Defence Forces played an important role in many ceremonial events across the country, including State Visits to Áras an Úachtaráin, bringing to each the customary distinction and dignity which makes me, as Úachtaráin na h'Éireann, very proud. I would also like to thank Óglaigh Náisiúnta na hÉireann for their important work in reaching out a hand of friendship and support to ex service men and women, embodying the great spirit of solidarity that lies at the heart of all that our Defence Forces do. I would like to conclude by thanking and commending each and every one of you for the valuable contribution you make to the cause of peace and justice across the globe. On behalf of the people of Ireland may I wish you and your families a very happy Christmas and a prosperous New Year.